A funny thing happened to Blake Caruso Dec. 12 on his way from finals at Mississippi State University to a duck hunt in the south Delta near Vicksburg. The senior got sidetracked, and boy, is he glad he did. 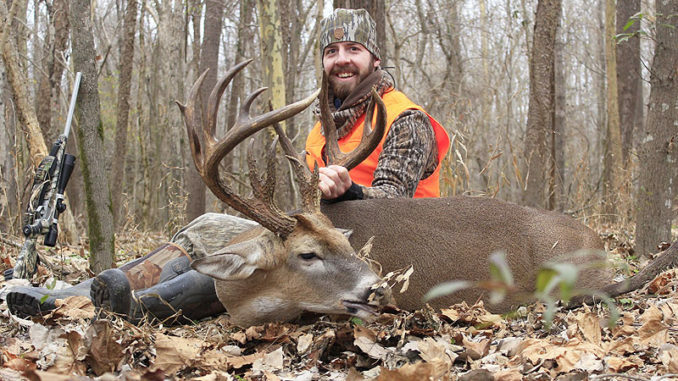 Acting on a tip from his older brother Dustin, Blake Caruso took his brother’s climber, borrowed a .35 Whelan rifle from a brother’s friend and shot the buck of a lifetime — a 191-inch monster on public land in North Mississippi. “I really don’t want to name the WMA because you know how it is, you put a buck out there like this and everybody and his brother will be hunting there the next few years,” Caruso said. The buck’s rack is tall, thick, wide and dark, sporting 16 points on a 10-point mainframe. The story behind it is short, at least for the Caruso brothers. “My brother and I and my dad and some friends, we’ve hunted this particular WMA for the past two or three years,” Caruso said. “We’ve always done pretty good there, killing a few bucks each year in the 120- to 130-inch range. We’ve always hunted this one section of the WMA, and on Dec. 9 Dustin was over there, and on a hunch, decided to scout this new area of that same section. 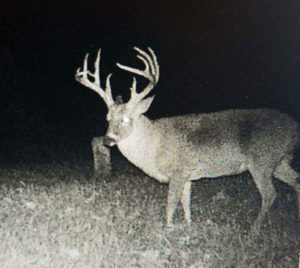 It was then that the lure of a possible giant buck became too much. The next day, Dustin flew to Oklahoma while Blake headed to the woods with the borrowed gun and stand, and with directions on how to get the mile into the woods and set up. “I got in there about 6:15 and found a decent tree, not a great one, and climbed up,” he said. 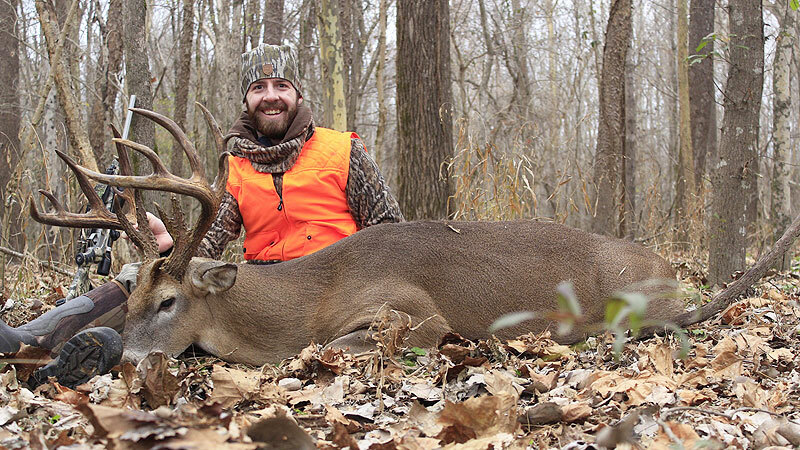 “I was settled about 6:20 and about 10 minutes later, I had a doe walk out about 40 yards. I decided to change trees and I moved to another one. From 8 to 10 that morning, I saw six deer, four does and two bucks. One of the bucks was a good one and I considered taking it. Good decision, about as good as the one he had made that morning when Caruso went prepared to stay in the tree all day. “From 10 until about 3 p.m., I didn’t see anything; it was like they quit moving totally,” he said. “I saw a few turkeys and some other animals but not a single deer. Then, about 3:30, they started coming back headed the other way toward the ag fields. Two does walked out, about 100 yards, and I noticed they were acting funny, and looking back. It was, but it was the doe that Caruso needed it to be — a hot one, the kind that can lead a big mature buck into a trap. As he waited, Caruso finished preparations, turning into position and checking the gun. Caruso said a small tree had fallen down on the edge of the pipeline, blocking his shot line for about half the clearing at the point where the deer were crossing. “She had just about cleared the pipeline on the other side when he finally decided to cross,” he said. “He was behind that tree top. I could see him but I couldn’t jeopardize the shot because of all the brush. I was ready for him. I mean when that third doe first stepped clear, I had put my crosshairs on her and practiced. I didn’t want to mess up. The gun roared and when it settled, Caruso liked what he saw. 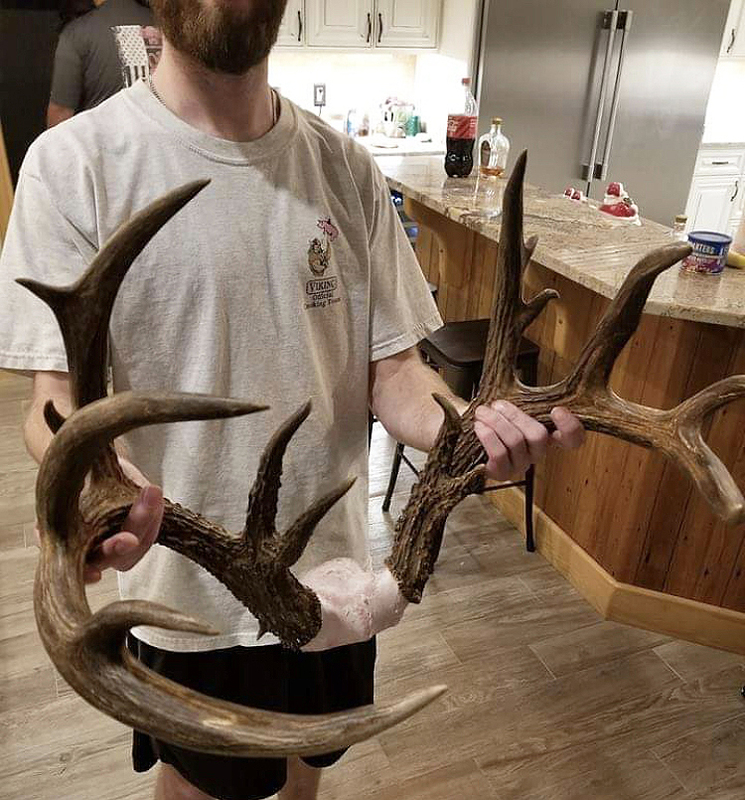 Blake Caruso killed this 191-inch-plus (gross) buck on Dec. 12 chasing a doe on a state Wildlife Management Area in North Mississippi with a .35 Whelan rifle during primitive weapon season. The buck struggled off, and Caruso looked around and realized he had no one to share the moment with. “I immediately called Dustin,” he said. “He was still at the Dallas airport and I know I was really excited because he told me he couldn’t understand anything I was saying. I told him I shot it and that he had to be down. He told me to call him back when I found him. I called Dad and I called Mom and a few others. I was so excited. It took about 30 minutes before I was ready to go look. Of course, there was a lot of work to do. “I had walked a mile from the truck to get in there, but my brother made arrangements with another friend to be ready to help me,” Caruso said. 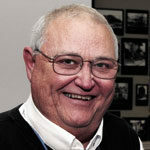 “I called him on my way out and within five minutes of me getting to the truck, he was there with his Ranger. We took off and could only get about halfway in there to him before there was another creek. Back at the truck, as they were loading the buck from the Ranger to the pickup, another truck drove up and stopped. “Where I was hunting was pretty close to the property line between the WMA and a farm, and turned out that this was the neighboring landowner,” Caruso said. “He asked me if I had killed anything, and I said yes. He asked if it was a buck, and I said yes. He asked if it was a good one, and I said, yes sir, it was a big one. This trail cam photo was from a neighboring landowner and was dated Nov. 24, 2017. Several people have measured the buck, and the gross score has consistently been within an inch of 191 inches, including over 16 inches of abnormal points. The biggest appears to be a 6-inch extra brow tine on the right side. The main beams were 25 6/8 and 25 inches, with the longest tines, the G2s, measuring 10 5/8 and 11 2/8. The bases were 6 inches thick and the mass extends to the end of the beams with the last legal measurements 4 2/8 and 4 3/8 inches. As for the duck hunt?